There are so many methods, so many theories of the best way, the easiest way, to prepare your garden beds for cultivation. Double-digging, trench composting, mulch gardening are all viable ways to enrich your soil and keep your plants happy, but I tend toward a “middle way” approach, and actually use a combination of these styles. By far the most labor-intensive of the methods we’ll discuss, this method can be used when soil is hard, sterile, and uninviting. I consider it the first step in a longer process. Here’s what you do. Dig a trench that’s roughly 12” wide and 24” deep, setting the soil aside (I put it in a wheelbarrow). Sift through the removed soil, as needed, to remove roots and stones. Layer lawn clippings, kitchen waste, compost, manure, etc., into the bottom of the trench. 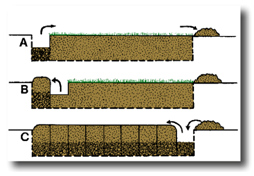 If you’re doing a series of trenches down a garden row or bed, dig your next trench, putting the soil you dig up into the trench you just filled with compost materials (see diagram). Continue the length of your row or bed, using the soil from the first dig to fill the last trench. Don’t forget to rest frequently and stay hydrated! This is hard work! Because double-digging can be very disruptive to soil ecosystems, it’s best to use it sparingly. I also recommend leaving the dug bed fallow and/or planted with green manure for a season before planting your crops. This gives the soil micro-organisms time to re-establish themselves. This is probably the simplest way to compost! If you have a small yard, are concerned about pests or smells, or simply don’t want to tend a compost pile, this may be just the way for you! There’s still some digging, but it’s not as intensive as the double-digging method. -In random spots in your garden, or in narrow trenches between your garden rows, dig down 8-24”, depending on your energy and enthusiasm (if you have digging animals in your neighborhood, you’ll want to go with the deeper trenches). Reserve the soil you’ve dug up. -Layer yard trimmings, kitchen waste, and other compostable materials in the bottom of your trench. Cover over with removed soil. If you want to be able to dig up your compost when it’s done “cooking”, mark with a stake. -If the soil is dry, watering heavily before filling the trench back in will kick-start the composting process. 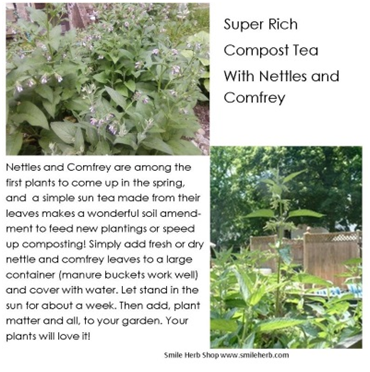 If you really want to get things going, water with nettle or comfrey “compost tea”. Ruth Stout is well known for her “no work” garden method. The basic idea is that rather than digging down into the soil, one builds up by adding thick layers of organic materials on top of cleared soil. At least 8” is recommended to prevent weeds from poking through. As the layers of mulch—rotten hay, grass clippings, leaves, vegetable trimmings—begin to decompose, they create a rich layer of humus for growing vegetables, flowers, and herbs. (For particularly stubborn weeds, a layer of newspaper can go down under the organic matter. The newspaper will rot harmlessly away in less than a year.) This is certainly the best soil amendment method for those with limited time, energy, or mobility. In my garden, once the beds have been dug well once (or maybe twice if the clay is really heavy) they get mulched to keep them rich and happy. Mulching has the added advantage of not disrupting soil ecosystems and in fact adding habitat for insects. Green manures are cover crops planted in your garden beds in-between regular crop plantings. I also use green manures to reclaim segments of the garden that have gotten unruly. The most common cover crops are nitrogen fixers like clovers, vetch, buckwheat or peas. Alfalfa is quick-growing and its deep roots can pull minerals from deep in the soil to enrich your soil. Green manures can be tilled into your beds before going to seed to add nutrients directly, or they can be left to out-compete weeds, provide habitat for beneficial insects, and protect soil from erosion. Green manure seed blends can be purchased from most seed companies. White clover is an excellent general cover as it is attractive and generally doesn’t grow above 8” high. I also like to grow small stands of grains like oats in patches throughout the garden. These are beautiful and provide food and habitat for wildlife. Well, there you have a quick-and-dirty (pun intended!) introduction to some of the most common soil preparations beyond sprinkling fertilizer. Of course you can always add well-aged manure, fish emulsion, or other compost to these methods to enrich even further. Whatever method you decide to use, Happy Gardening!